Our Platinum Starter Kit is a complete brooder set-up with everything you need to get started with your new baby chicks — just set it up and add some bedding! This kit features the Brinsea EcoGlow 20 — a safe, radiant heat brooder preferred by most backyard chicken owners over traditional heat lamps. 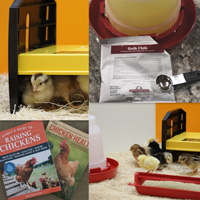 Also included is the Chicken Help Book Bundle — Storey's Guide to Raising Chickens and the Chicken Health Handbook. This 2-book set is a must-have for any poultry owner. The Platinum Starter Kit will easily handle up to 25 chicks for 2 weeks, and is great for reusing over and over again. What everyone needs to get their birds started! This kit includes two - 1 quart waterers, 1 game bird feeder, 1 single bulb brooder complete with infra-red bulb, brooder thermometer and the book, “Raising Bobwhite Quail”.